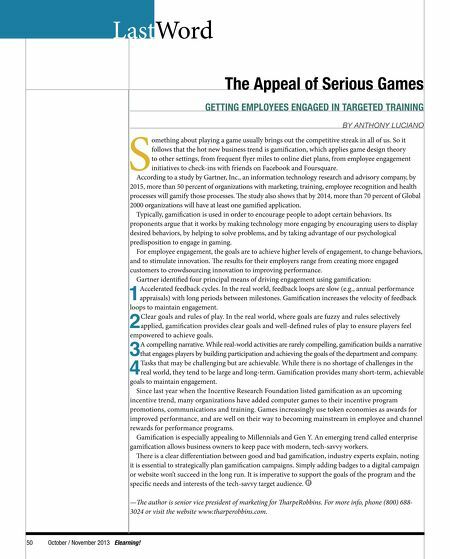 Editor'sWord LastWord The Appeal of Serious Games GETTING EMPLOYEES ENGAGED IN TARGETED TRAINING BY ANTHONY LUCIANO S omething about playing a game usually brings out the competitive streak in all of us. So it follows that the hot new business trend is gamifcation, which applies game design theory to other settings, from frequent fyer miles to online diet plans, from employee engagement initiatives to check-ins with friends on Facebook and Foursquare. According to a study by Gartner, Inc., an information technology research and advisory company, by 2015, more than 50 percent of organizations with marketing, training, employee recognition and health processes will gamify those processes. Te study also shows that by 2014, more than 70 percent of Global 2000 organizations will have at least one gamifed application. Typically, gamifcation is used in order to encourage people to adopt certain behaviors. Its proponents argue that it works by making technology more engaging by encouraging users to display desired behaviors, by helping to solve problems, and by taking advantage of our psychological predisposition to engage in gaming. For employee engagement, the goals are to achieve higher levels of engagement, to change behaviors, and to stimulate innovation. Te results for their employers range from creating more engaged customers to crowdsourcing innovation to improving performance. Gartner identifed four principal means of driving engagement using gamifcation: Accelerated feedback cycles. In the real world, feedback loops are slow (e.g., annual performance appraisals) with long periods between milestones. Gamifcation increases the velocity of feedback loops to maintain engagement. Clear goals and rules of play. In the real world, where goals are fuzzy and rules selectively applied, gamifcation provides clear goals and well-defned rules of play to ensure players feel empowered to achieve goals. A compelling narrative. While real-world activities are rarely compelling, gamifcation builds a narrative that engages players by building participation and achieving the goals of the department and company. Tasks that may be challenging but are achievable. While there is no shortage of challenges in the real world, they tend to be large and long-term. Gamifcation provides many short-term, achievable goals to maintain engagement. Since last year when the Incentive Research Foundation listed gamifcation as an upcoming incentive trend, many organizations have added computer games to their incentive program promotions, communications and training. Games increasingly use token economies as awards for improved performance, and are well on their way to becoming mainstream in employee and channel rewards for performance programs. Gamifcation is especially appealing to Millennials and Gen Y. An emerging trend called enterprise gamifcation allows business owners to keep pace with modern, tech-savvy workers. Tere is a clear diferentiation between good and bad gamifcation, industry experts explain, noting it is essential to strategically plan gamifcation campaigns. Simply adding badges to a digital campaign or website won't succeed in the long run. It is imperative to support the goals of the program and the specifc needs and interests of the tech-savvy target audience. 1 2 3 4 —Te author is senior vice president of marketing for TarpeRobbins. For more info, phone (800) 6883024 or visit the website www.tharperobbins.com. 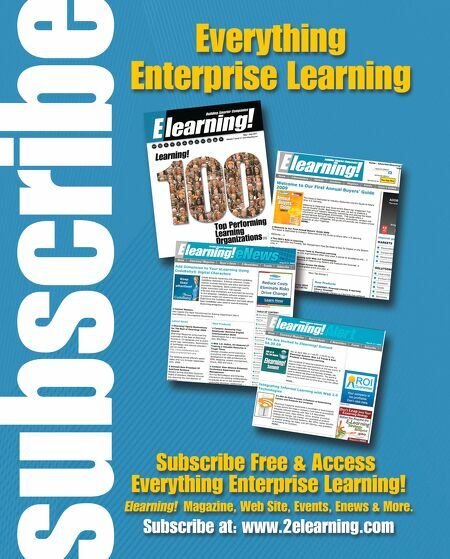 50 October / November 2013 Elearning!